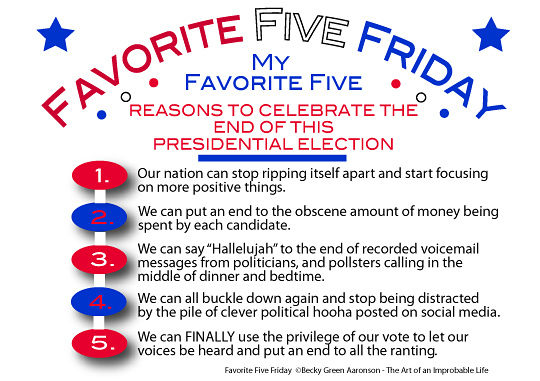 This entry was posted in Favorite Five Friday and tagged Becky Green Aaronson, democracy, favorite five friday, political campaigns, politics, presidential election, voting by Becky Green Aaronson. Bookmark the permalink. *Tuesday will most certainly be interesting. We’re going old school, with a pot roast in the oven and the kids and dog all circled up around the television watching the results. It will be a memorable evening for all. Thanks for the wonderful way you put words together. We’re planning an evening around the television too, crossing our fingers and toes that it’s an evening to celebrate. Should be interesting! Whichever way it falls, at least it will finally put an end to all this vitriolic BS. Time to move on to more positive things. Thanks for your nice comment, by the way! I’ll be glad the election is over–It’s been a long time coming! 1. No more phone calls from survey takers or recordings. 2. No more angry TV ads ripping people apart. 3. No more flyers and brochures in the mail that cost too much money and too many trees to create. 4. Our focus can be on more important things than political chatter. 5. The time to make decisions will be here! The massive pile of junk mail, I mean political ads, sends me over the edge too. Enough already! It’s such a waste.